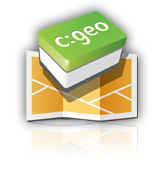 I am ha ppy to announce that c:geo is now also available for BlackBerry BB10. Get it for free at appworld.blackberry.com/webstore/content/28277410. If you are still stuck on BB10.0, you download it from here. The requested item does not exist or is not available. I am unable to add c:geo again to teh Blackberry World. See https://www.ruinelli.ch/geocaching-with-the-blackberry-z10 for more details. Last time I tested it worked very well. I will see if I can backport those new features, but am not sure if all of them will work. Also it will take a while as I am currently busy with other things.